This Caribbean Pearl on which we live experienced Olympic glory for the first time at the Games held in Paris in 1900 when Ramón Fonst won the gold medal for individual epée, thereby becoming the first Olympic champion from Cuba and Latin America. He added to that achievement a silver medal and so Cuba placed twelfth in the final medals listing. At the St. Louis Olympics (United States) 1904, Cuba reached a surprising third place in the medals race thanks to the brilliant showing of the fencers headed again by Ramón Fonst who won gold in the epée and foil. His fellow team-mate Manuel Dionisio Díaz won in the sabre. Alongside of them, two Americans also competed for Cuba, Charles Tatham and Albertson Van Zo Post. Post won another title, one silver and two bronze medals while Tatham got one silver and one bronze, totaling nine medals in all. Cuba was absent from the games in London 1908, Stockholm 1912 and Antwerp 1920, reappearing in Paris 1924 with 10 athletes, mainly fencers, among whom was the by now 41-year-old Ramón Fonst—none of them won any medals. At Amsterdam 1928, sprinter José Barrientos was the sole Cuban competitor, but he was eliminated in the 100 meter run. Cuba didn’t participate at the Los Angeles 1932 Games nor did it go to Berlin in 1936. The Helsinki Games of 1940 and those of London 1944 were both suspended by WWII. At London 1948, Cuba returned to the medals listing when the two Carlos de Cárdenas, Jr. and Sr., won the silver in the Star Class in sailing. At Helsinki 1952 and Melbourne 1956 Cuba took part without winning medals. Rome 1960 was the first Olympic Games in which it competed after the triumph of the Revolution but there it also didn’t win any prizes. It wasn’t until Tokyo 1964 that a Cuban returned to stand on the podium: Enrique Figuerola for 100 meters. At Mexico 1968, new energy began to appear and we obtained 4 silver medals in boxing for the performances of Enrique Regueiferos and Rolando Garbey and for the 4 x 100 meter relay. After 68 years, at Munich 1972, Cuba once again tasted the sweetness of Olympian gold, on this occasion the 3 medals won by boxers Orlando Martínez, Emilio Correa and Teófilo Stevenson. Another silver medal was won by boxer Gilberto Carrillo, along with 4 valuable bronze medals including the one by the outstanding effort of the Cuban men’s basketball team. At Montreal 1976, athletes trained under the revolutionary process won 13 medals: 6 gold, 4 silver and 3 bronze. The most outstanding athletes were Alberto Juantorena who won the 400 and 800 meters, Teófilo Stevenson who got his second Olympic belt and Héctor Rodríguez who, in spite of competing with a hurt rib, earned Cuban judo its first Olympic gold by virtue of his courage and determination. At Moscow 1980, without the participation of some of the powerhouses of the Western world, our flag fluttered over the podiums for a respectable accumulated total of 20 medals: 8 gold, 7 silver and 5 bronze. We should highlight the third title won by Teófilo Stevenson and the gold for javelin won by María Caridad Colón, a feat that made her the first Latin American woman to win a medal at the Olympics. After being absent from Los Angeles 1984 and Seoul 1988, the Cuban results at Barcelona 1992 were historical because it classified Cuba as fifth among all the countries with a total of 31 medals: 14 gold, 6 silver and 11 bronze. Of all these the most outstanding were Javier Sotomayor’s gold for the high jump, the women’s volleyball and baseball teams, and the first title for boxer Félix Savón. At Atlanta 1996, we won 25 medals, 9 gold, 8 silver and 8 bronze, with notable distinction for Driulis González in judo and for Félix Savón, who stood on the podium for the second time as did our girls in volleyball. Sydney 2000 netted the Cubans a grand total of 29 medals, 11 gold, 11 silver and 7 bronze, to take the ninth spot among all the countries. Sotomayor was back to win in the high jump while Félix Savón and the women’s volleyball team both got their third titles. In 2004, competition returned to Athens, its place of origin. 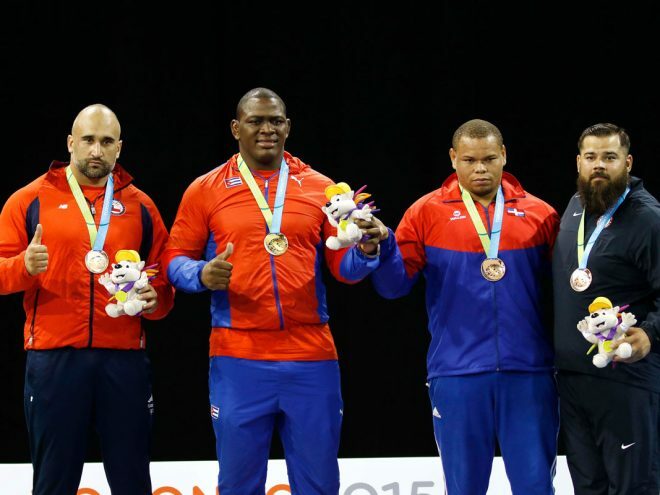 Cuba got 27 medals: 9 gold, 7 silver and 11 bronze and so occupied 11th place in the countries’ medals listing. Special mention must be given to the triumph of Osleidys Menéndez in the javelin. At Beijing 2008, the Cuban delegation won only 2 gold medals; we have to add to that the 11 silvers and 11 bronzes but the country descended to 28th place. Our champions were wrestler Mijaín López and hurdler Dayron Robles. At London 2012 we collected 15 medals, 5 gold, 3 silver and 7 bronze, including that for Mijaín López’s outstanding performance. The rhythms of the samba are still reverberating through our memories even though the Rio Games of 2016 are by now part of history. There, Cuba won 11 medals: 5 gold, 2 silver and 4 bronze. Once again Mijaín López was our star athlete, brilliantly winning his third title. Cuba’s dominance at both of these continental games, particularly in the last few decades, can be clearly seen in the overwhelming number of titles and medals won; in fact there are so many that it would take up far too long to list, one by one, all the athletes who have shone at these competitions. Instead, we shall briefly sum up the Cuban performance at these regional events. At the Central American Games, which go back to 1926, Cuba and Mexico have always been the great winners. Cuba dominated at Havana 1930, Barranquilla 1946, Panama City 1970, Santo Domingo 1974, Medellín 1978, Havana 1982, Santiago de los Caballeros 1986, Mexico City 1990, Ponce 1993, Maracaibo 1998, Cartagena 2006 and Veracruz 2014. Ever since the Pan-American Games were inaugurated in Buenos Aires in 1951, Cuba has uninterruptedly participated at all the editions with a performance that can only be described as brilliant. At that first edition we ended up in third place with a total of 28 medals: 9 gold, 9 silver and 10 bronze. Between Mexico 1955 and Winnipeg 1967, Cuba alternated between being fifth and ninth. But this picture abruptly changed at Cali 1971 when it took over second place in the medals race bested only by the United States. Cuba kept its second place until Toronto 2015 when it was bumped down to fourth. We must emphasize that at the Pan-American Games in Havana in 1991, Cuba took first place with a collection of 140 gold medals, 62 silvers and 63 bronzes for a grand total of 265. Such a fabulous result certainly makes clear the prestige of the Cuban sports movement.